The Father and the Head of the Ukrainian Greek Catholic Church His Beatitude Sviatoslav during the Hierarchical Divine Liturgy proclaimed today, September 25, the cathedral of the Holy Prince Volodymyr in Australia's capital Canberra the pilgrimage place for all the faithful Ukrainian Greek Catholics living in Australia. His Beatitude Sviatoslav gave to the church of St. Prince Volodymyr the relics of the saint martyr, Volodymyr Pryima, who last year in Stradch was declared as a patron of the UGCC laity. The Archbishop said that he is praying for our people in Australia to never lose the faith of their fathers and never cease to be themselves. Coserved with the Head of the Church the Apostolic Nuncio in Australia Paul Gallagher and the Bishop Petro (Stasyuk), the Bishop of Australia, New Zealand and Oceania. 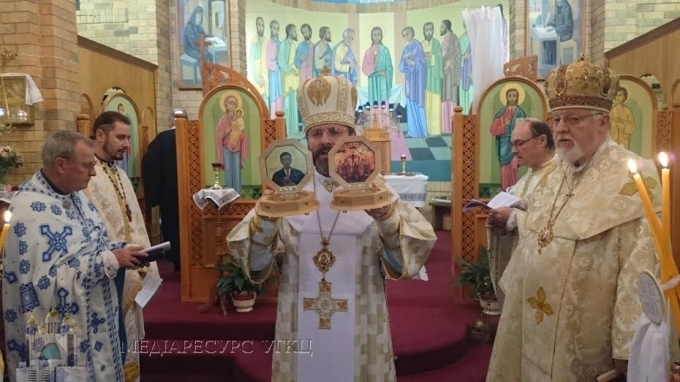 It should be noted that the prior of the church of St. Volodymyr is Lawrence Foote, who has no Ukrainian roots, but was able to learn Ukrainian. And for many years he serves in our Church. At the same time Fr. Lawrence is a chaplain for students and teachers of the Australian National University in Canberra. To pray together with His Beatitude Sviatoslav came Fr. Mykhaylo Solomko with his family – the prior of the church of St. Nicholas of Ukrainian Autocephalous Orthodox Church. Before that, the Head of the Church prayed for the repose of the souls at the monument to the Holodomor of 1932-1933, which is located in the courtyard of the Church of St. Nicholas UAOC. To the Liturgy with the Head of the UGCC came the Chargé d'Affaires of Ukraine in Australia Mr. Mykola Dzhydzhora with the family.